Spain’s 1978 Constitution and subsequent democratic functioning has been profoundly conditioned by the country’s historical legacy. This can best be seen by analysing particular institutions, often referred to as ‘poderes fácticos’ (a phrase which has no precise translation but roughly encompasses centres of power which enjoy major political influence). Given their significance under the Franco regime, the most important of these institutions are the military and the Catholic Church, both of which have played a critical role in the development of modern Spain.1 However, they have had differing impacts on the political process in the post-Franco period. 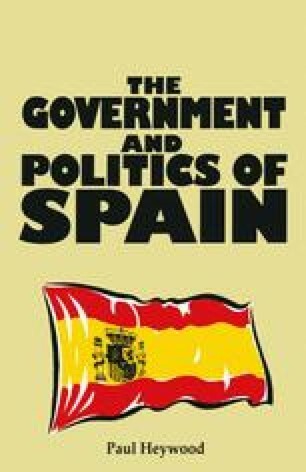 Whereas a large part of the former represented a real threat to the success of democratic transition — which it viewed with considerable mistrust — the latter deliberately distanced itself from active political engagement, a response in part to the virtual identification of Church and state in the early Franco years. More recently, however, whilst the military has effectively eradicated any residual golpista tendencies and fully accepts civilian authority, the Catholic Church — influenced by the theologically conservative pontiff, John Paul II — has become increasingly outspoken on political matters.